You could give up and flee or you could choose the fight. My advice, choose the fight. Born and riased outside of our nation's capital, Christina attended Westlake High School in Waldorf, MD where she would rack up five state championships (three individual and two team), and earn finalist honors for Maryland Track Athlete of the Year. From there, the venue changed, but the results did not. At The Ohio State University, while earning a degree in Criminology, Christina became a Buckeye legend, earning 10 Big Ten Championships, a Suzy Favor Big Ten Female Athelte of the Year award, 8 All-American honors, 2 OSU records, and the 2012 NCAA National Championships in both the 60m Hurdles and the 100m Hurdles. 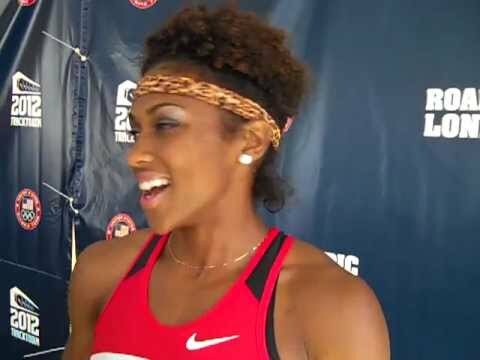 Once she left Ohio State, Christina was looked at as being the future of the 100m Hurdles, however in 2013, suffered an achilles rupture, which nearly ended her career. Through her faith in God, instead of giving into the battle, she decided to, "choose the fight." At the 2016 Olympic Trials in Eugene, Christina was a semi-finalist. Christina's journey has given her unique insight, stating, "For me what I do is not just about myself. Instead it is for everyone who has ever thought about giving up. I know all about struggling and hardships and if I can keep pushing so can everyone else." She aspires to be a motivational speaker, spreading knowledge about Track & Field to young athlete who know little about the professional side of the sport, noting, "There is so much opportunity with this sport that so many Americans know nothing about." Christina trains in Montgomery, AL with coach Charles Ryan.